Home All How To's How to vaccinate your PC and Flash Drives against Harmful Autorun threats? 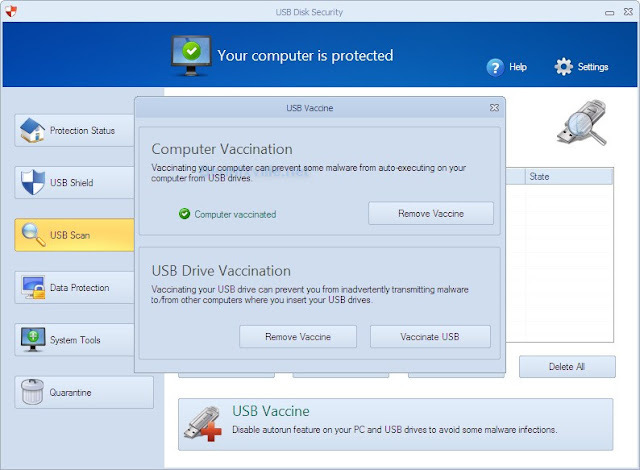 How to vaccinate your PC and Flash Drives against Harmful Autorun threats? Flash drives or any external storage is one of the most targeted medium by most PC threats in order to penetrate other good devices or computer victims. Most of the time, flash drives were infected by Autoruns-type of programs that serves as an engine to spread / do more serious attack into the system if unprotected. We know that those USB Devices nowadays are really important in preserving our data and because also of its portability so, blocking the USB usage in your PC would complicate your productivity I guess. The most easy and secure things to do is to vaccinate your PC or USB Storage to avoid getting infected with autoruns using USB Disk Security 6. 5.Check your flash drive or any partition in your PC you will notice an autorun.inf, etc -this can’t be deleted or replaced by incoming Autoruns injection. You can remove the vaccination anytime or re-vaccinate your drive if newly format. This will work in trial version of USB Disk Security 6 but I recommend having the license one to get an additional protection such as USB Shield, Scanning, Data protection and other features aside from your update Antivirus.